Doctor Who: The Moffat Scripts - THE TIME OF THE ANGELS / FLESH AND STONE | Warped Factor - Words in the Key of Geek. Dr. Moo appreciates the gravity of the situation. 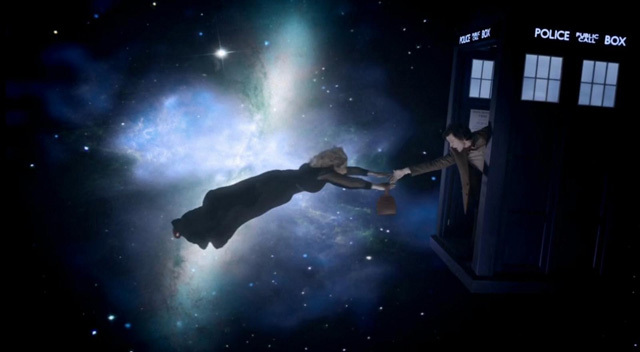 The Time of Angels/Flesh and Stone was one of the most anticipated stories of series five. Featuring the return of River Song (from Moffat’s previous story Silence in the Library/Forest of the Dead) as well as the Weeping Angels (from another of Moffat’s, the fan-favourite Blink) and the pivotal moment from the trailer when the Doctor points a gun and shoots it. There was a lot that these two episodes had to do. So with all this the question on everyone's lips was the same: Can it live up to the pre-broadcast hype? Let’s find out. We start with one of the best cold opens in the history of the show. A mysterious figure, soon revealed to be River Song, going on a rampage of sorts through a spaceship and making a bid to escape, saying some cryptic threatening things to her pursuers all the while arranging for the Doctor, several centuries away in the future, to come back and extract her. Matt Smith and Alex Kingston are both brilliant here and the whole thing is such an intriguing way to start a story that you need to know what’s going on. Bravos are in order for not just Steven Moffat writing such a scene but also to the stylised direction of Adam Smith who knows just how to get the best look and feel out of the scene without coming across as trying too hard. It’s a shame that he hasn’t been reused by the show since because he completely nails it. Then we find out it’s the Weeping Angels that we’re dealing with and the story begins to unravel slightly. Many have criticised the monsters’ repeat appearances saying they’d be better as a one-hit wonder with Blink and while I disagree with that for the most part (as I’ll explore further when we get to The Angels Take Manhattan in a few months’ time) in this story they’re probably the weakest link in an otherwise extremely strong chain. What are their powers exactly? The angels in this story are inconsistent with the angels of Blink. Previously they sent their victims back in time but here they kill (at least) three different people, and not one of them suffers that fate, in fact one of them becomes an angel themselves! Add to that that now they’re capable of looking at each other. Add to that the concept that the image of an Angel becomes itself an Angel (which makes me dispute how Sally got the details of the transcript, Easter eggs, etc. to the Doctor in Blink since there were photos of the angels in there). Moffat explains about how the Angels at Wester Drumlins were just scavengers and how this lot are an army but it seems more than a little bit handwavey to me. But despite that they still manage to be scary. However there is one moment that completely undermines this and that’s getting to see them move. One of the scariest things about the Angels in Blink was how you only needed for them to be off screen for a split second for them to have crossed an entire room. There’s nothing inconsistent with that here but the crucial thing that made this scary was that we never got to them in the act of moving. But no more, now we get a story in which several Angels are seen moving around and what should be an extremely tense edge-of-your-seat moment will not have you screaming but laughing. Such a shame because earlier on in the story we had one hell of a great scare. I’m talking about the sequence when the image of an Angel is first mentioned when Amy is inside a truck with an Angel on a video monitor while the Doctor and River are outside… and then the Angel moves. And then it comes out of the screen and enters the room. And it tries to attack Amy. And scares the crap out of the audience in the process. You have to admire Karen Gillan’s acting in this story, showing us her full range as an actress. In the aforementioned scene she shows us Amy scared, something we hadn’t got to see yet. 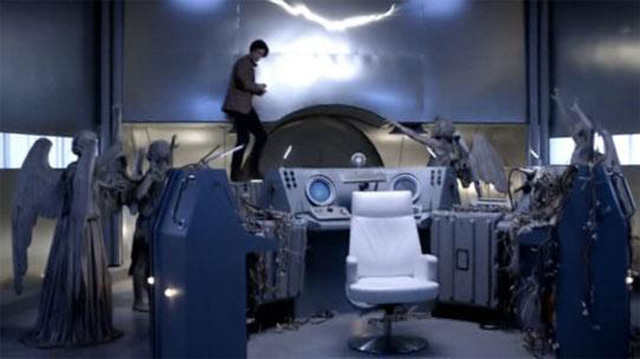 There’s Amy convinced her arm’s made of stone even though it isn’t and let’s not forget the countdown (which Moffat uses very very well to up the tension). Gillan gets to show us Amy’s fun side too when she’s mocking the Doctor and River for “how [they] keep score” before an unfortunate One For The Dads moment the story ends with her trying to seduce the Doctor… for some reason. *sigh* I had really thought we were past this by now. Rose and Martha were both sexually interested in the man from Gallifrey, and one of the many many reasons everyone loves Donna is because she did away with that trend. With Amy it was all going so well until this happened! It’s awkward to watch and doesn’t add anything to the story and feels out of place, but most crucially of all it doesn’t feel consistent with the character. A big plus for these two episodes is River Song. Alex Kingston is fantastic in the role and teases the audience with just enough clues as to who she is without revealing anything. Last time we only knew that she knows the Doctor in what was then his future. Now we find out that she’s in prison for killing a good man and the Doctor is warned by Father Octavian not to trust her – he is also seen by the audience (but not the Doctor) giving River frequent threats that he will tell the Doctor who she is believing he won’t trust her anymore if he finds out. It’s all very interesting and you feel drawn in to find out more about who she is and teases us that more will be revealed “when the Pandorica opens” – but otherwise that’s all we’re getting from her this time. Moffat you tease! DOCTOR: Can I trust you. River Song? RIVER: If you like… but where's the fun in that? And that’s not all for teasing the audience! In the preceding stories of series five we’ve seen cracks in the universe but we don’t know anything about them. Now we learn some more: they’re caused by the explosion at the end of the universe, an explosion so big that time itself runs out because of it. An explosion that can terrify the Weeping Angels. An explosion that can even erase entire people from existence. And it started on the day of Amy’s wedding. If that doesn’t hook you in to finding out what comes next then I don’t know what will. One of the things I love about this story is how the Doctor uses the crack to his own ends. The 11th Doctor is a resourceful man, no doubt about that, and here, though he doesn’t know what the cracks are, he still realises how he can utilise it to neatralise the Angels and save the day. A very nice touch indeed. To conclude, The Time of Angels/Flesh and Stone is a story that poses more questions than it answers and as a result it’s best enjoyed as part of the overall experience of series five rather than as a standalone story. It may be overstuffed with so much going on and may be filled with several issues and inconsistencies but if you can ignore that and judge it on its own merits what you’ll find in these two episodes is a very good story. So did The Time of Angels/Flesh and Stone live up to the pre-broadcast hype? Generally speaking the answer is yes. Overall this is a strong and solid slice of Doctor Who and it’s well worth taking the series five DVD boxset off your shelf and watching these two episodes again today.